Regenerating Neck and Décolleté Cream leaves the skin feeling firmer, smoother and plumper. It protects against free radicals whilst supporting the skin’s natural regenerative functions. We are all used to focusing on our faces with anti-ageing and other skincare products, and it is easy to forget the neck and décolleté area. But as we age it isn’t only our facial skin that loses its elasticity, the neck and décolleté need just as much nourishment, protection and care. 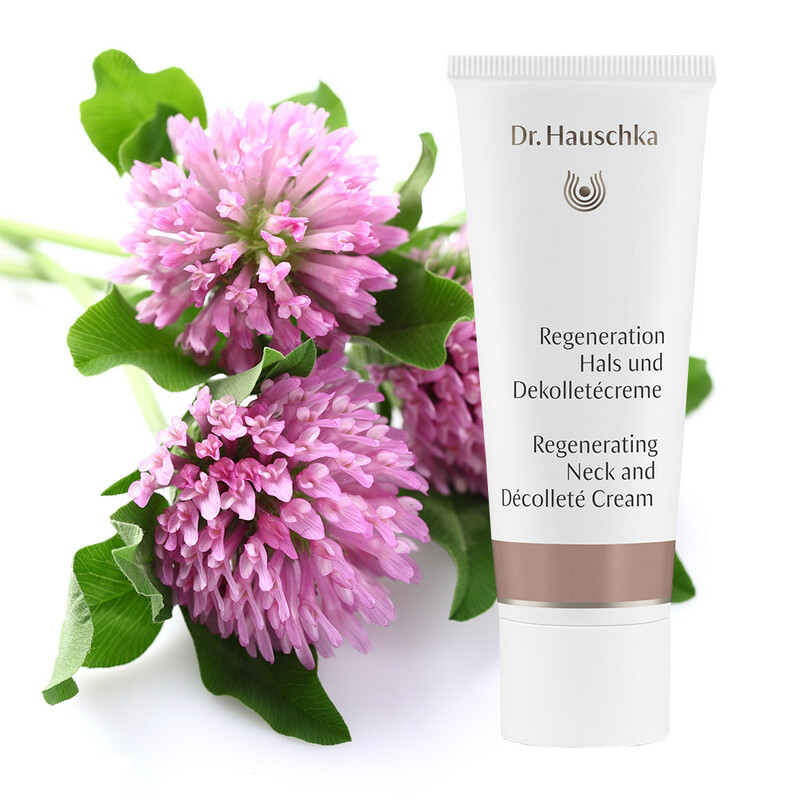 This is where Dr Hauschka’s Regenerating Neck and Décolleté Cream fits in, not only will it reduce the appearance of fine lines and fully nourish the skin, it will also protect whilst firming and toning. Easily absorbed, skin will feel softer and plumper. This is achieved using a mix of powerfully-hydrating ingredients including Marshmallow, Birch Leaves, Red Clover and Argan Oil. Skin Type: Perfect for mature skin. Application: After cleansing, toning and moisturising in the morning, apply the cream evenly to the neck and décolleté area. Tip: This is perfect for using with other products from the ‘Regenerating’ range, including; Regenerating Eye Cream, Regenerating Day Cream, Regenerating Serum and Regenerating Intensive Treatment. Matching Products: Treat the rest of your body too with Dr. Hauschka Regenerating Body Cream. Ingredients: Water (Aqua), Helianthus Annuus (Sunflower) Seed Oil, Glycerin, Alcohol, Hamamelis Virginiana (Witch Hazel) Water, Macadamia Ternifolia Seed Oil, Sesamum Indicum (Sesame) Seed Oil, Prunus Amygdalus Dulcis (Sweet Almond) Oil, Equisetum Arvense Extract, Betula Alba Leaf Extract, Rosa Damascena Flower Extract, Simmondsia Chinensis (Jojoba) Seed Oil, Cocos Nucifera (Coconut) Oil, Beeswax (Cera Alba), Althaea Officinalis Leaf Extract, Punica Granatum Fruit Extract, Hectorite, Butyrospermum Parkii (Shea) Butter, Lysolecithin, Trifolium Pratense (Clover) Extract, Fragrance (Parfum)*, Limonene*, Linalool*, Citronellol*, Geraniol*, Coumarin*, Citral*, Benzyl Benzoate*, Eugenol*, Farnesol*, Benzyl Salicylate*, Argania Spinosa Kernel Oil, Chondrus Crispus Extract, Oryzanol, Xanthan Gum, Sodium Stearoyl Lactylate, Glyceryl Stearate, Lecithin, Stearic Acid, Malpighia Punicifolia (Acerola) Fruit Extract.